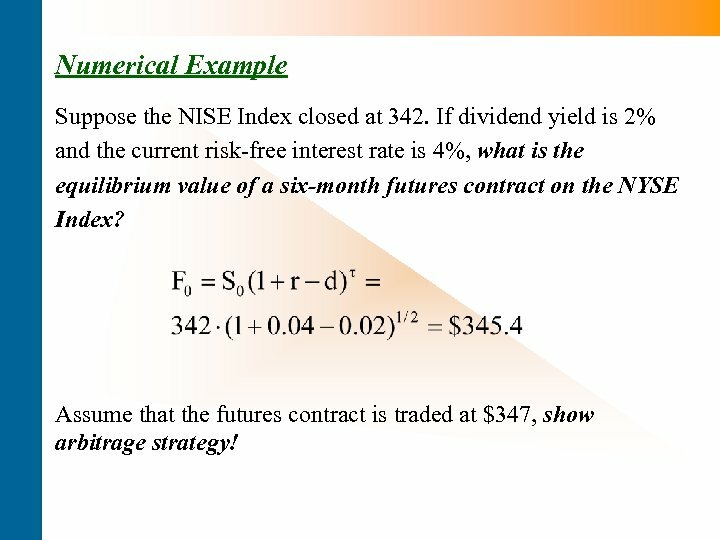 Numerical Example Suppose the NISE Index closed at 342. 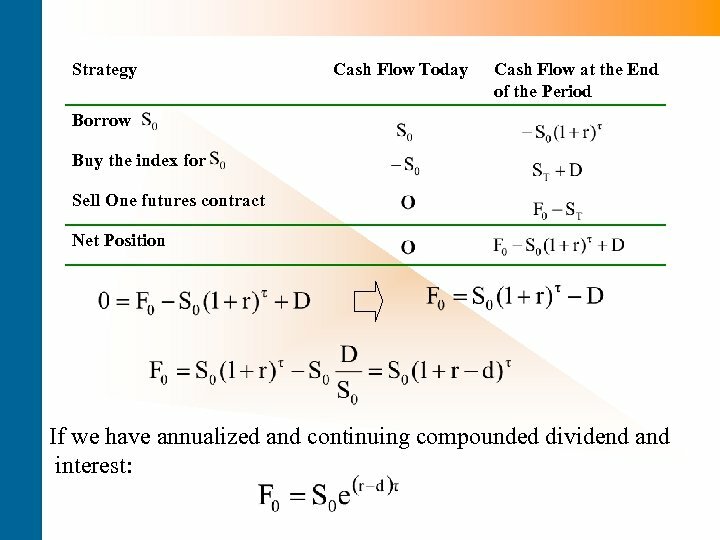 If dividend yield is 2% and the current risk-free interest rate is 4%, what is the equilibrium value of a six-month futures contract on the NYSE Index? 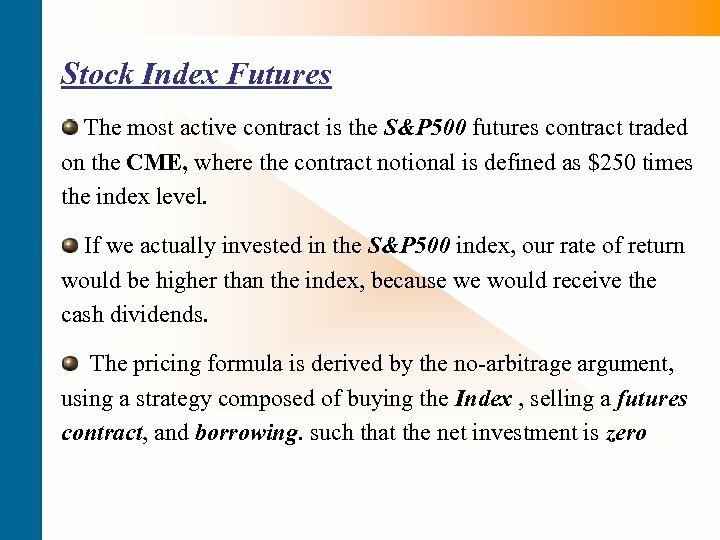 Assume that the futures contract is traded at $347, show arbitrage strategy! 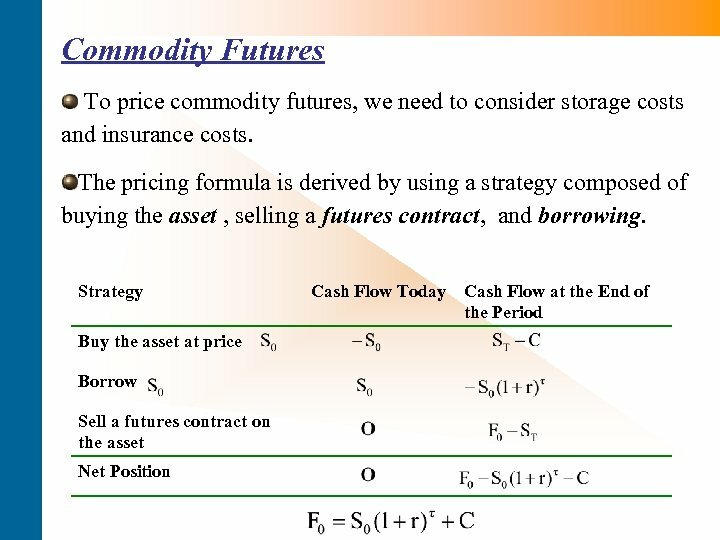 Currency Futures Currency futures contracts are used by firms having exposure to foreign exchange risk. 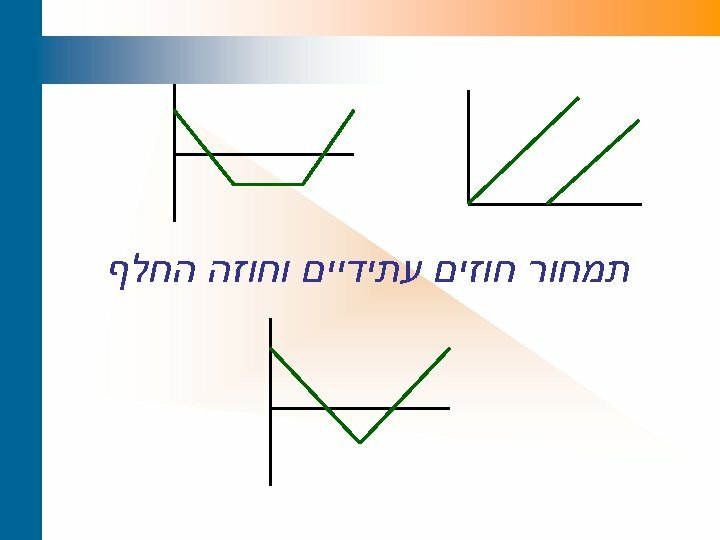 For example, a Israeli firm sell its goods in US and therefore receives USD in exchange for its product. 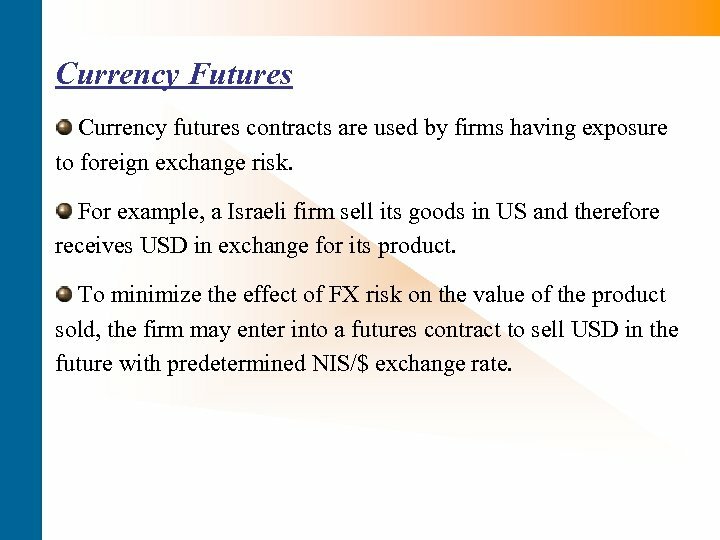 To minimize the effect of FX risk on the value of the product sold, the firm may enter into a futures contract to sell USD in the future with predetermined NIS/$ exchange rate. 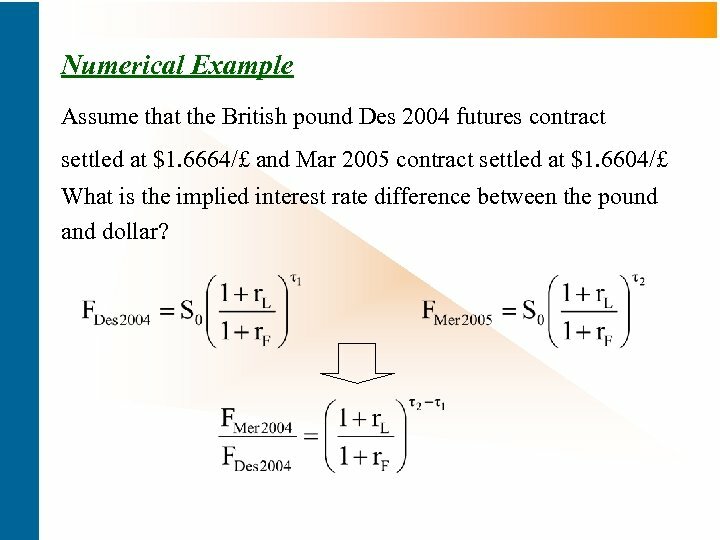 Numerical Example Assume that the British pound Des 2004 futures contract settled at $1. 6664/£ and Mar 2005 contract settled at $1. 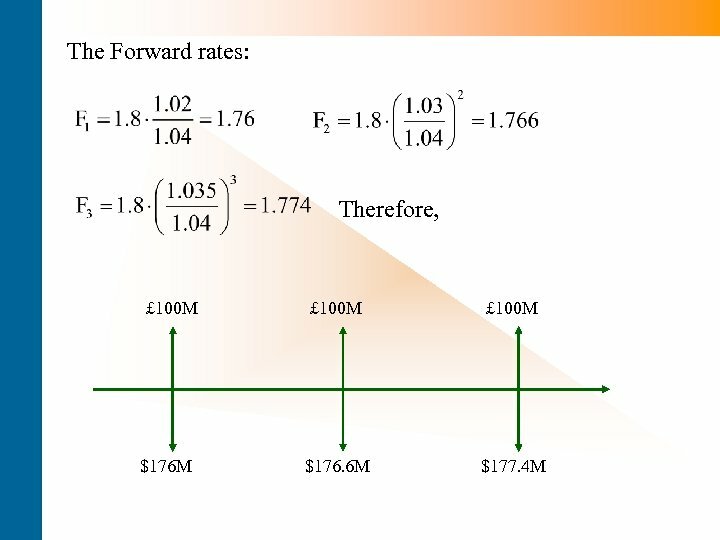 6604/£ What is the implied interest rate difference between the pound and dollar? 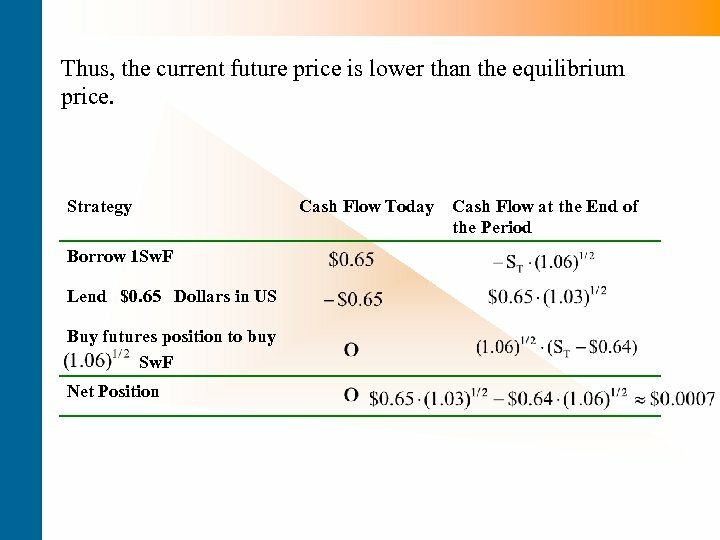 Numerical Example Assume that the spot price of gold is $340 per ounce and the one year futures price is $357. 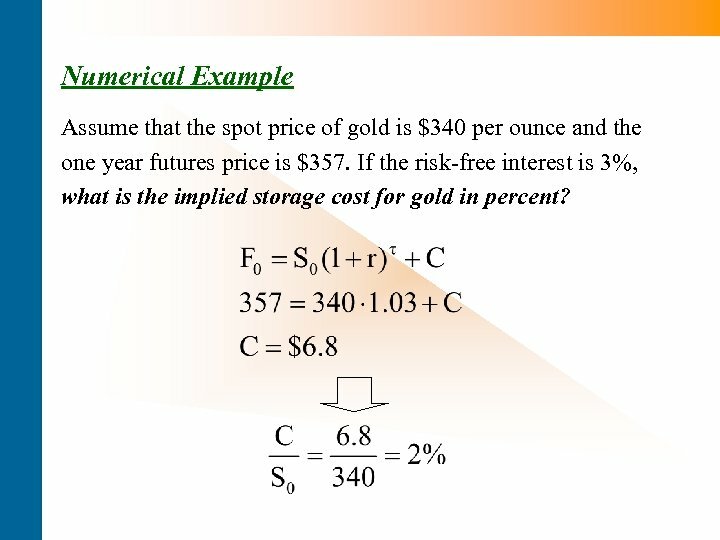 If the risk-free interest is 3%, what is the implied storage cost for gold in percent? 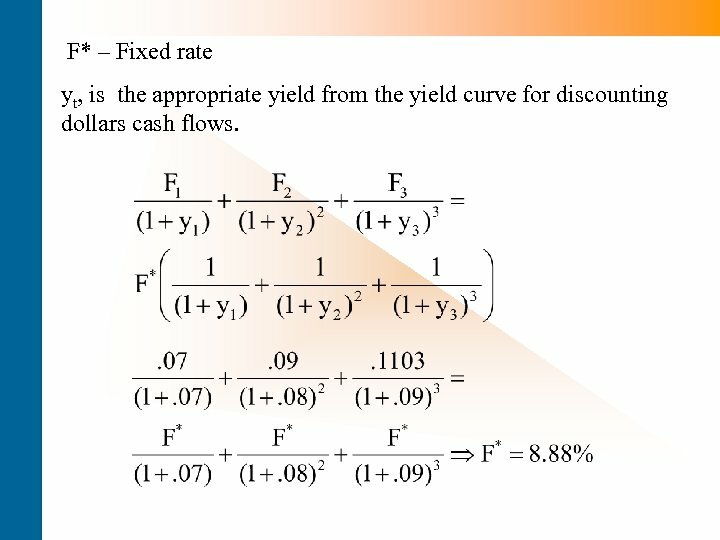 F* – Fixed rate yt, is the appropriate yield from the yield curve for discounting dollars cash flows. 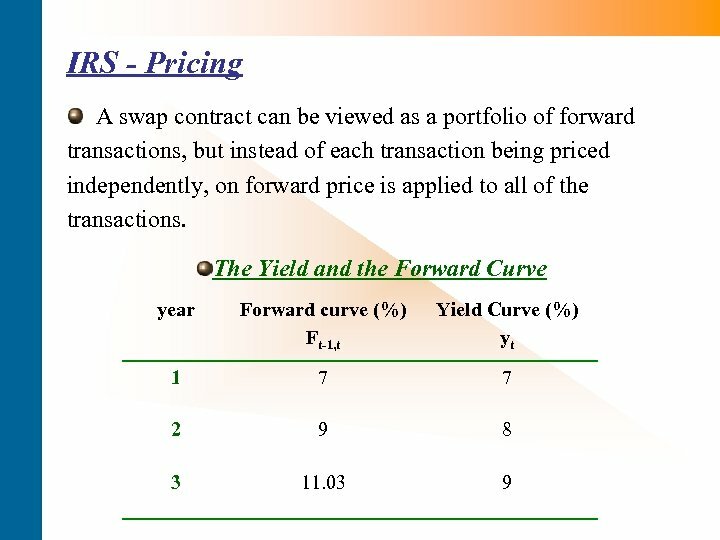 IRS – Quotations Swaps are quoted in terms of spreads relative to the yield of similar-maturity Treasury notes. 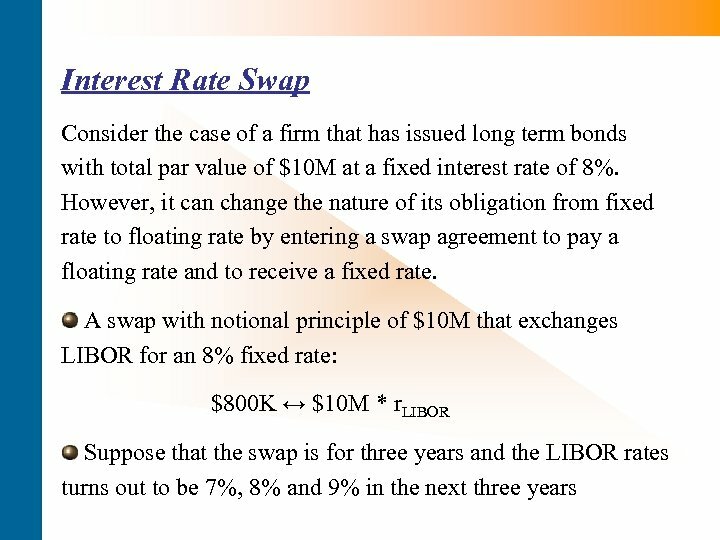 For instance, a dealer quote 10 years swap rates as 31/35 bp against LIBOR. 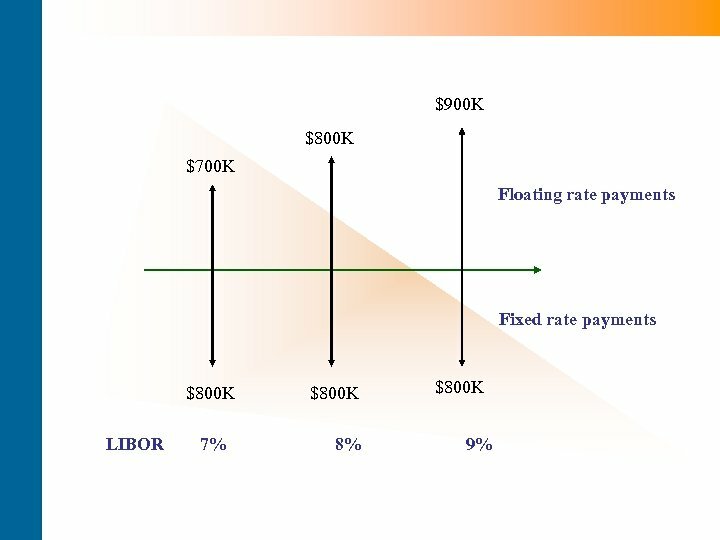 If the current note yield is 7%: The dealer is willing to pay 7%+0. 31%=7. 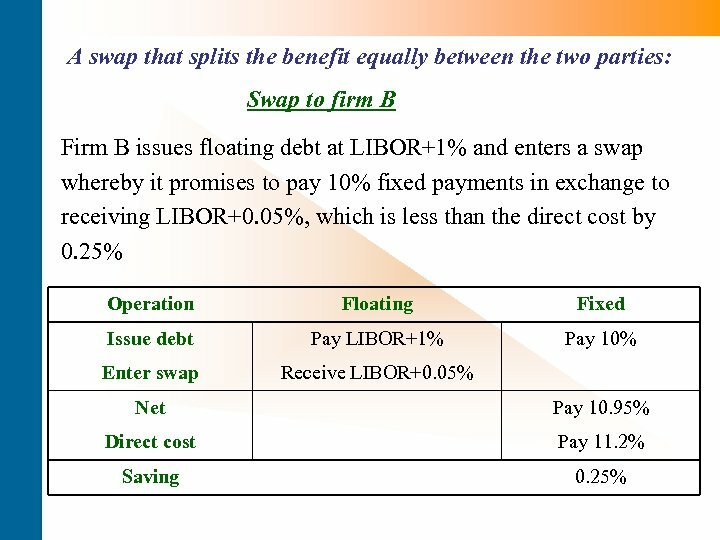 31% against receiving LIBOR and to receive 7%+0. 35%= 7. 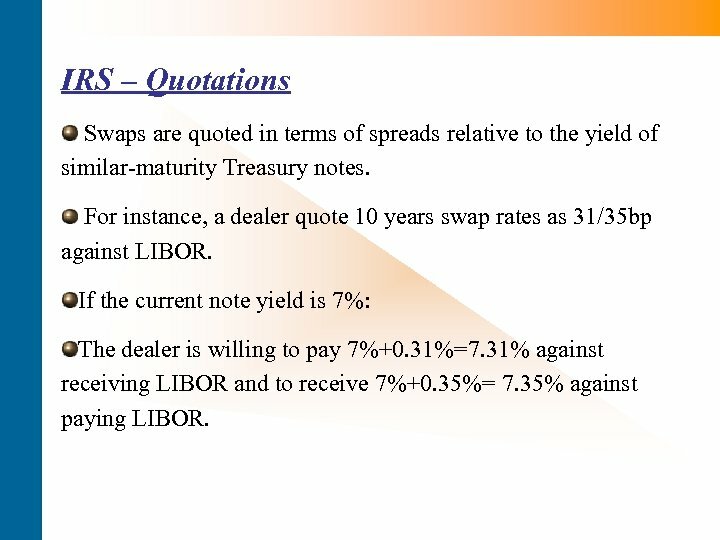 35% against paying LIBOR. 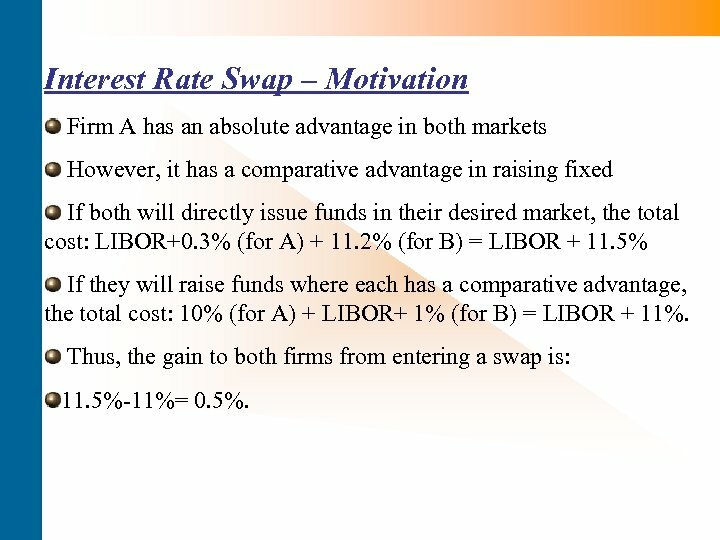 Interest Rate Swap – Motivation Firm A has an absolute advantage in both markets However, it has a comparative advantage in raising fixed If both will directly issue funds in their desired market, the total cost: LIBOR+0. 3% (for A) + 11. 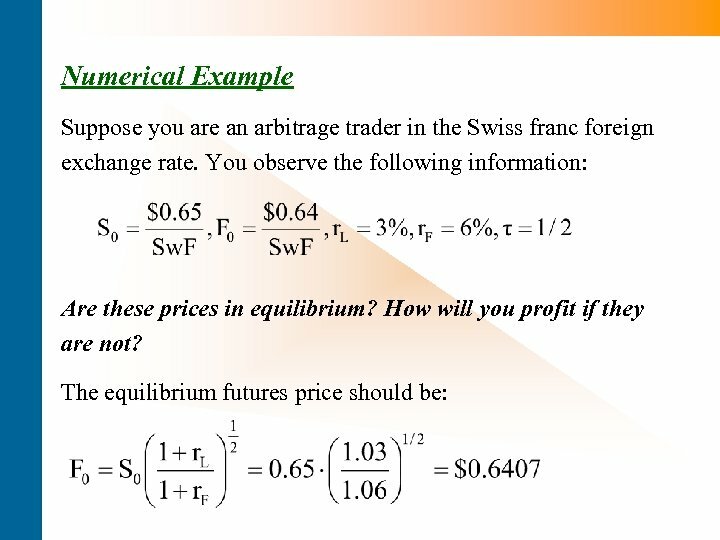 2% (for B) = LIBOR + 11. 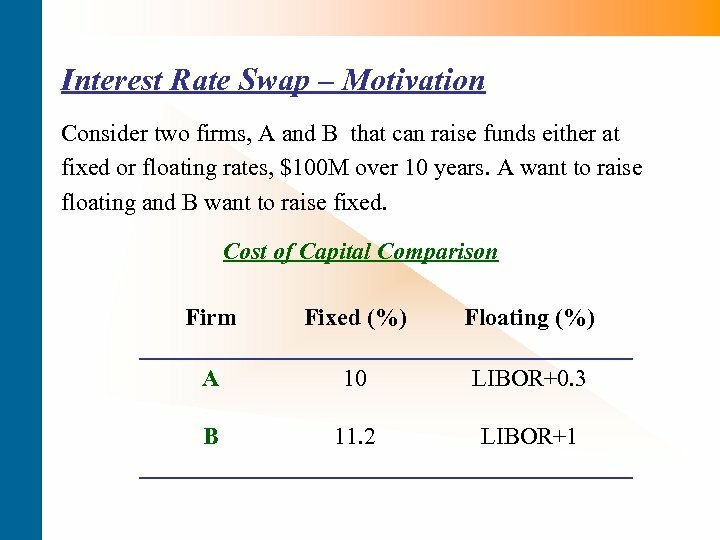 5% If they will raise funds where each has a comparative advantage, the total cost: 10% (for A) + LIBOR+ 1% (for B) = LIBOR + 11%. 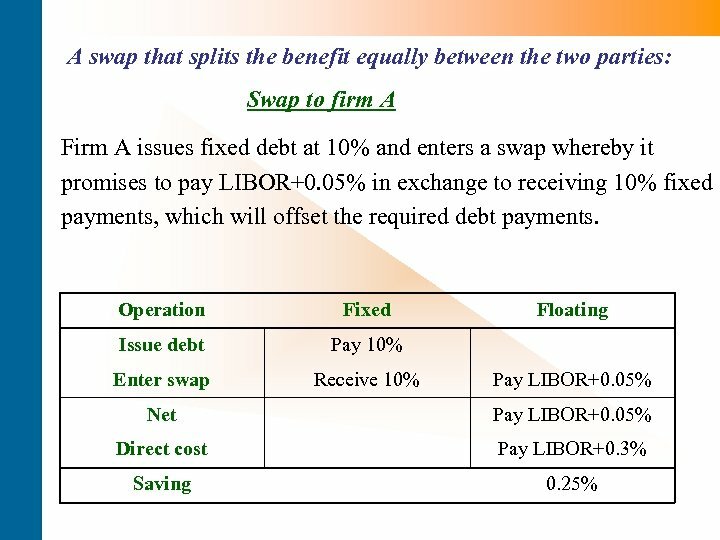 Thus, the gain to both firms from entering a swap is: 11. 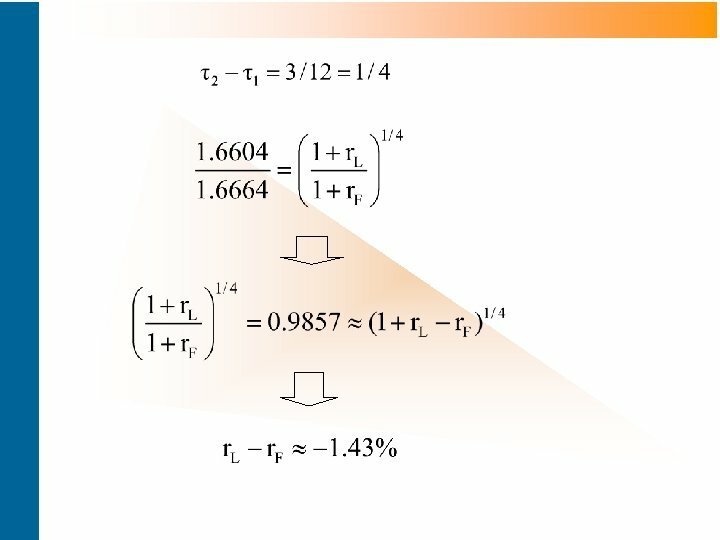 5%-11%= 0. 5%. 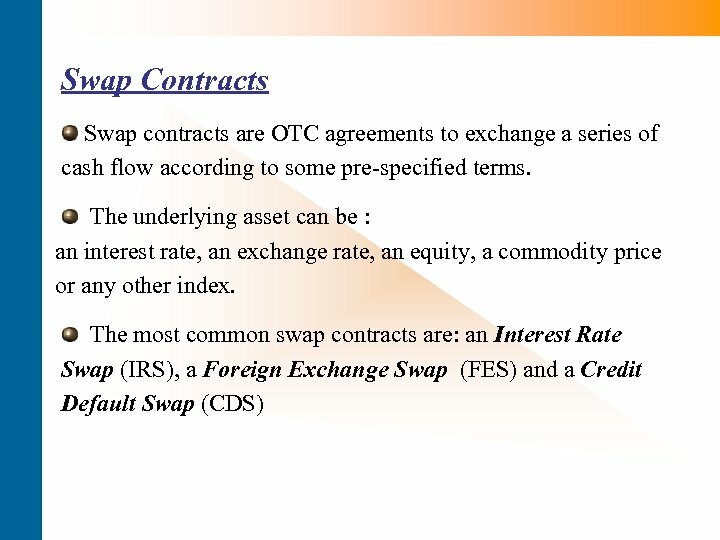 Foreign Exchange Swaps are agreements between to parties to exchange currencies according to a pre-determined formula. 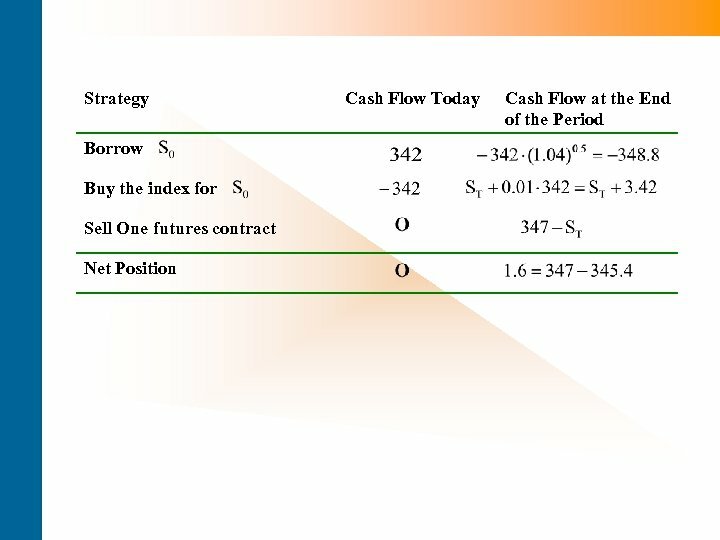 FES enable the firm to quickly and cheaply hedge its currency exposure. 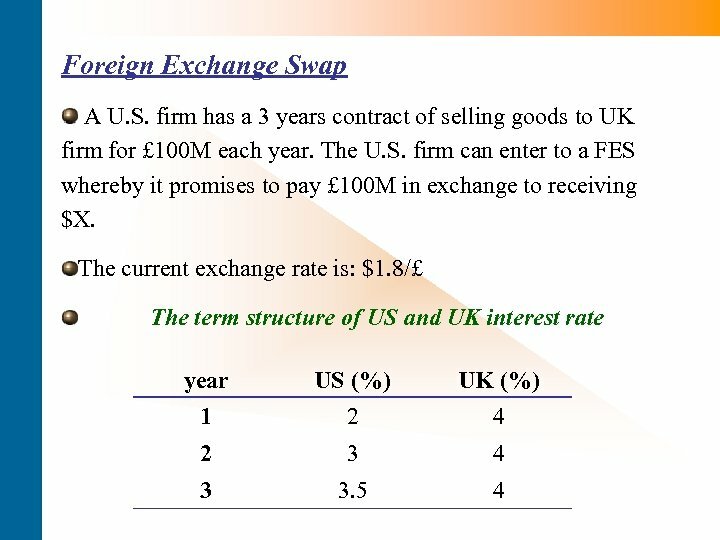 For Instants, a U. S. firm sell its goods in UK and therefore receives British pound in exchange for its product. 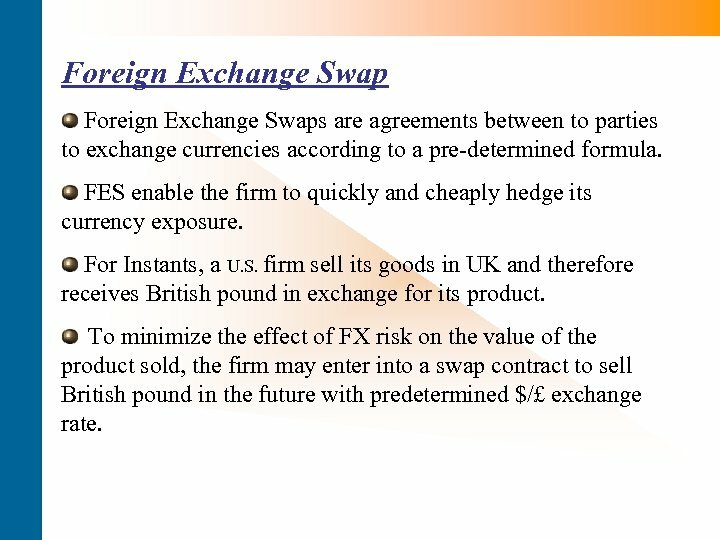 To minimize the effect of FX risk on the value of the product sold, the firm may enter into a swap contract to sell British pound in the future with predetermined $/£ exchange rate. 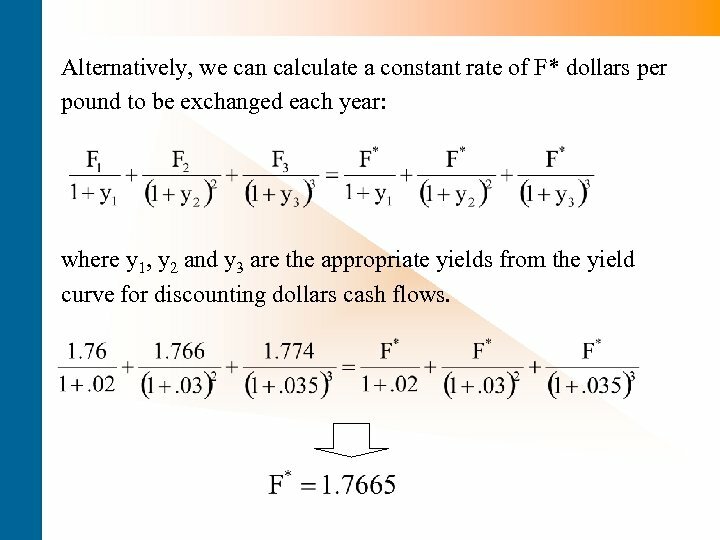 Alternatively, we can calculate a constant rate of F* dollars per pound to be exchanged each year: where y 1, y 2 and y 3 are the appropriate yields from the yield curve for discounting dollars cash flows. 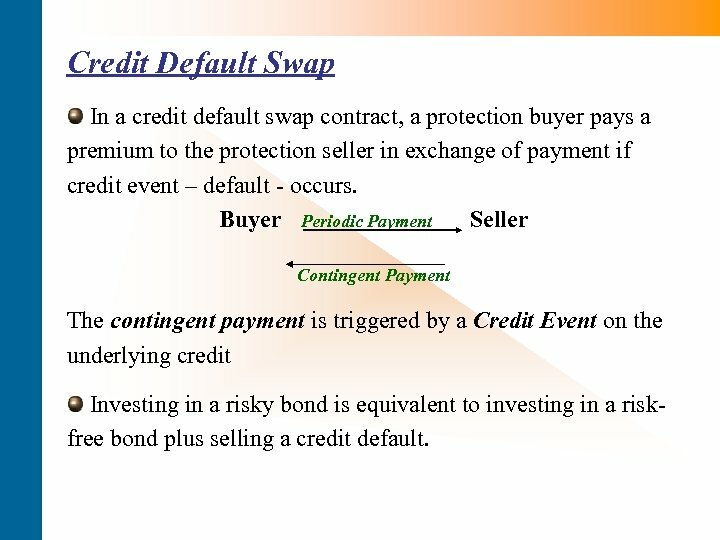 Credit Default Swap In a credit default swap contract, a protection buyer pays a premium to the protection seller in exchange of payment if credit event – default - occurs. 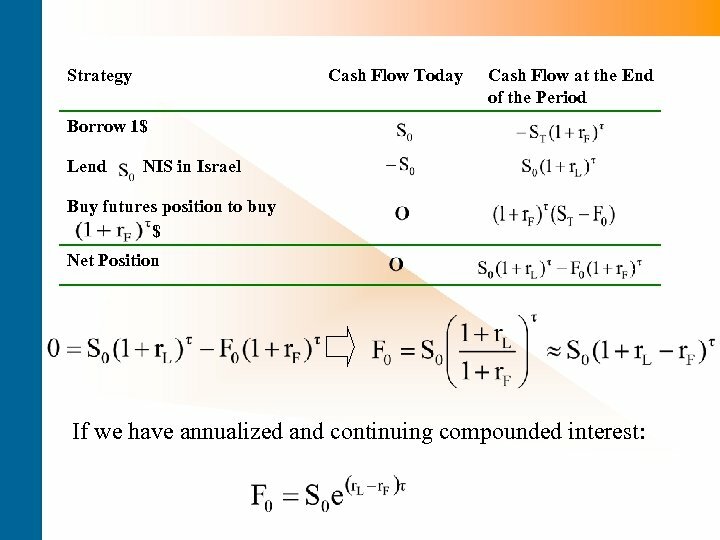 Buyer Periodic Payment Seller Contingent Payment The contingent payment is triggered by a Credit Event on the underlying credit Investing in a risky bond is equivalent to investing in a riskfree bond plus selling a credit default. 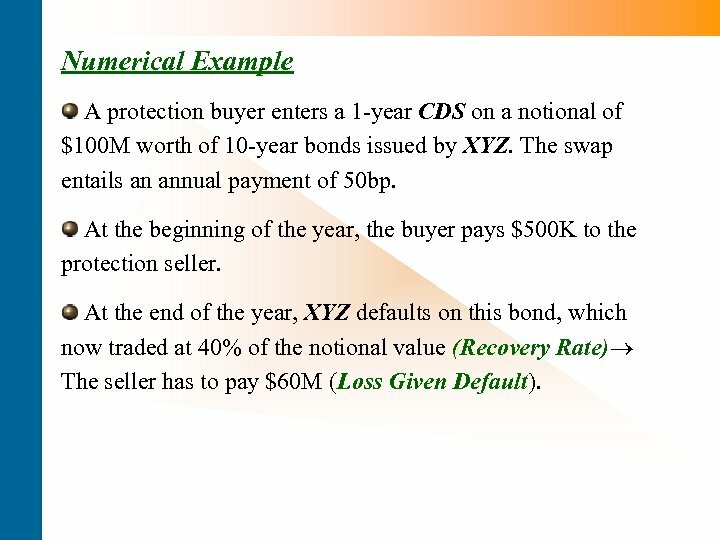 Numerical Example A protection buyer enters a 1 -year CDS on a notional of $100 M worth of 10 -year bonds issued by XYZ. 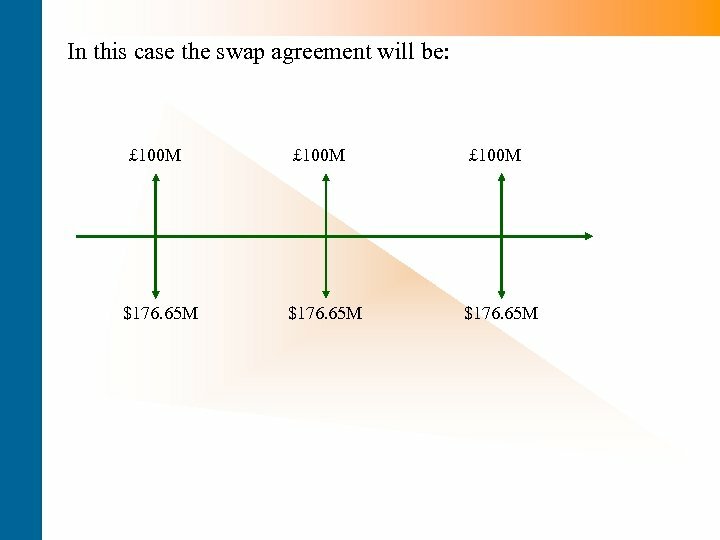 The swap entails an annual payment of 50 bp. At the beginning of the year, the buyer pays $500 K to the protection seller. At the end of the year, XYZ defaults on this bond, which now traded at 40% of the notional value (Recovery Rate) The seller has to pay $60 M (Loss Given Default). Copyright © 2006 Pearson Addison-Wesley. All rights reserved.